I must be a glutton for punishment. 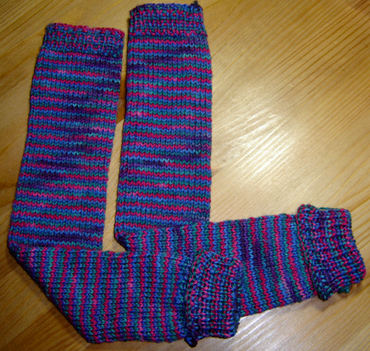 I started knitting these leg warmers back in the winter but soon abandoned the idea when my wee girls were less than thrilled with the idea of trying them on. The other day my hubby brought home a video (actually the first disk of a new television series) from the rental store to watch. We don't have cable so when we want to watch something we have to rent it or buy it. He brought home "Heroes." I've seen it everywhere as of late. Well back to the knitting, I have a simple equation: television + sitting on the couch for an extended period of time = knitting. I started tackling the leg warmers again for lack of a better idea. This time I pulled them apart enough to get rid of the funky ruffle. It wasn't grabbing me. I ended up with this. I made these ones so long they remind me of the babylegs that are all the rage for infants & toddlers. I like how they turned out. They are more utilitarian than my last version. They will keep the legs warms on those "must wear dresses days." Of course it never stops at just one pair when you have twins. I'm hard at work on the next pair and my dear hubby has gone back to the video rental store another time so we could watch disk 2 of Heroes. 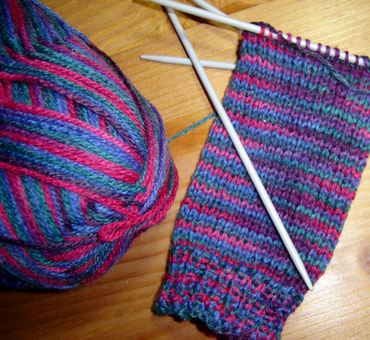 I think I'm hooked, let's hope the girls are hooked on their new leg warmers too! I was thinking about renting 'Heros' too. I've heard such good things about it.